Cristiano Ronaldo is one of the modern greats in world football, alongside the pantheon of greats such as Cruyff, Pele, Maradona, Gerd Muller, Beckenbauer, etc. The shift from an out-and-out winger to a clinical figure par excellence is there for everyone to see. Ronaldo has been in superhuman form for the past 4-5 years. His ability to shoot from acute angles with great bursts of pace into counter attacks had run La Liga defences ragged. His ability to run past defenders and audaciousness has few parallels. He likes to drift from the left touchline into central positions but for that he require mobile team mates to make runs and create space. 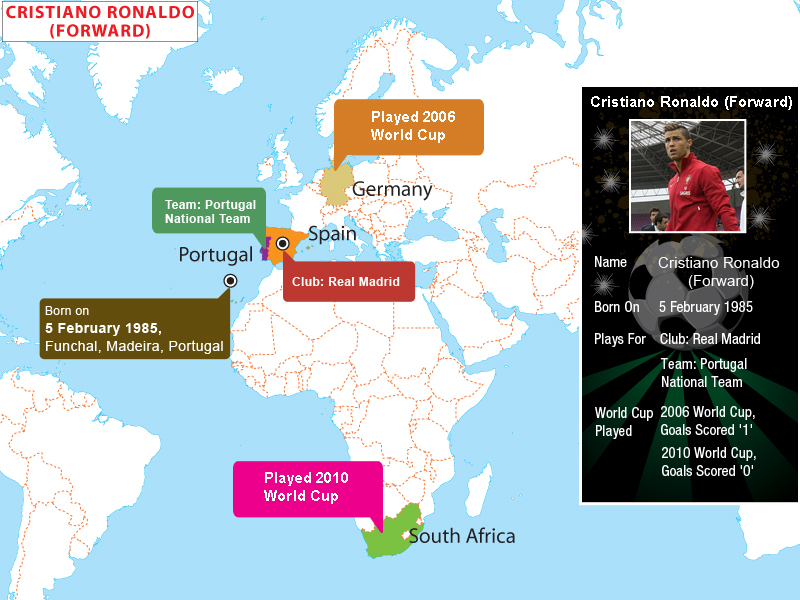 Cristiano Ronaldo was born in Madeira Portugal. He joined the Sporting Lisbon youth academy in 1995 and showed steady progress, breaking into the first team in the 2002-03 season. News of his great prowess and talent spread fast and the likes of Arsene Wenger and Joan Laporta were interested in securing his signature but Sir Alex Ferguson finally managed to secure his signature for 15 million Euros in 2003. His initial years in Manchester United were slightly wasteful as he indulged in lots of trickery and sought to score the perfect goal thereby not doing justice to his immense potential. At the same time he had been shining for the Portuguese National team in Euro 2004 and World Cup 2006 leading them to the finals and semifinals respectively. The turning point in his career came when goal-keeping coach Rene Meulensteen told him to focus on getting the job done and scoring goals instead for waiting for the perfect goal. The 2006-07 season after the World Cup he scored 42 goals in all competitions and was the first player since Andy Gray to win the PFA Young Player and Players’ player of the year in the same year. The next season he led Manchester United to Champions League glory, scoring in the final. With interest growing over Ronaldo’s signature from Real Madrid it seemed inevitable that he would leave, and leave he did, for a then world record fee of 80 million pounds sterling. His start in Real Madrid was electric scoring 4 goals in his initial 4 appearances. He went to superhuman levels in the following years scoring over 50 goals in the next 3 seasons and has already scored 24 goals for Real Madrid this season. Famous goals include the great finish at the Nou Camp against Barcelona in 2012.Meanwhile he has become even more integral to the National team following the retirement of Deco, Luis Figo, Costinha, Rui Costa, Pauleta and the ageing of stalwarts like Simao, leading Portugal to the quaterfinal in South Africa and the Semi Final in Euro 2012. He has won the English Premier league thrice, the La Liga and the FA Cup once, the Copa del Rey once and also won the FIFA Club World Cup. He recently equaled Pauleta’s record of most goals for Portugal and won the Ballon D’Or once, the Player of the year twice and is in the running to win the Ballon D’or this year. He has a statue in Madame Tussauds and also has made his own museum in Madeira which he will unveil next month. He has had relationships with models like Gemma Atkinson and Alice Goodwin ad is currently in a relationship with swimsuit model Irina Shayk. He has a child called Cristiano Ronaldo Jr. He is frequently involved with charities like the Tsunami relief and Aids ventures. Ronaldo endorses famous brands such as Pepe Jeans, Emporio Armani and Nike. 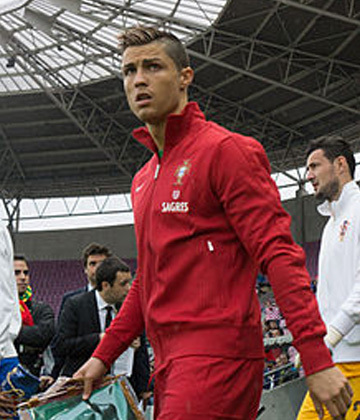 Ronaldo is seen as an arrogant player and the likes of Sepp Blatter have commented on this. Another controversy which he was involved in was when he faked an injury to get Rooney sent off in the 2006 World Cup quarterfinals. He is called as the Commandante by the Portuguese public and was awarded the inaugural Ferenc Puskas award for the most beautiful goal of the year in 2009.